Italian physiologist; born May 26, 1841, in Casale Monferrato, Piedmont; died Sept. 6, 1898, at Turin. After finishing his course at the college he entered the University of Turin as student of medicine, receiving his doctorate in 1862, and going in the same year to Paris to take a post-graduate course, where he became assistant to Hiffelsheim in his electrotherapeutic clinic. Returning to Turin, he assisted Moleschott in the physiological department of the university. 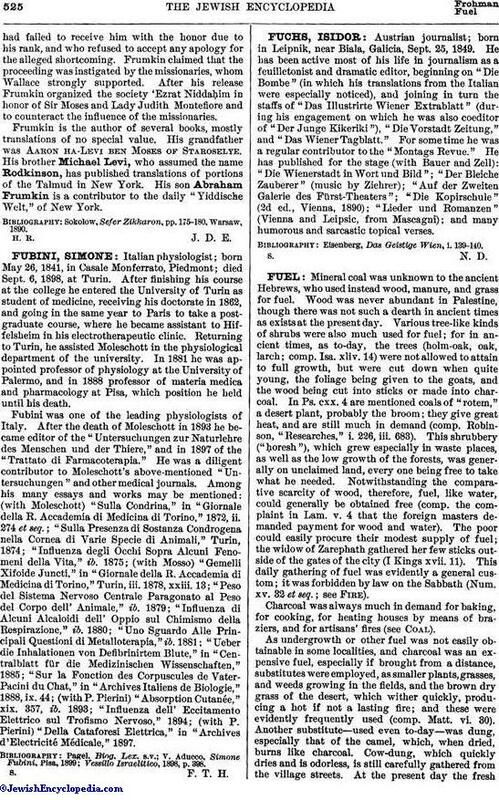 In 1881 he was appointed professor of physiology at the University of Palermo, and in 1888 professor of materia medica and pharmacology at Pisa, which position he held until his death. Fubini was one of the leading physiologists of Italy. After the death of Moleschott in 1893 he became editor of the "Untersuchungen zur Naturlehre des Menschen und der Thiere," and in 1897 of the "Trattato di Farmacoterapia." He was a diligent contributor to Moleschott's above-mentioned. "Untersuchungen" and other medical journals. Among his many essays and works may be mentioned: (with Moleschott) "Sulla Condrina," in "Giornale della R. Accademia di Medicina di Torino," 1872, ii. 274 et seq. ; "Sulla Presenza di Sostanza Condrogena nella Cornea di Varie Specie di Animali," Turin, 1874; "Influenza degli Occhi Sopra Alcuni Fenomeni della Vita," ib. 1875; (with Mosso) "Gemelli Xifoide Juncti," in Giornale della R. Accademia di Medicina di Torino," Turin, iii. 1878, xxiii. 13; "Peso del Sistema Nervoso Centrale Paragonato al Peso del Corpo dell' Animale," ib. 1879; "Influenza di Alcuni Alcaloidi dell' Oppio sul Chimismo della Respirazione," ib. 1880; "Uno Sguardo Alle Principali Questioni di Metalloterapia," ib. 1881; "Ueber die Inhalationen von Defibrinirtem Blute," in "Centralblatt für die Medizinischen Wissenschaften," 1885; "Sur la Fonction des Corpuscules de Vater-Pacini du Chat," in "Archives Italiens de Biologie," 1888, ix. 44; (with P. Pierini) "Absorption Cutanée," xix. 357, ib. 1893; "Influenza dell' Eccitamento Elettrico sul Trofismo Nervoso," 1894; (with P. Pierini) "Della Cataforesi Elettrica," in "Archives d'Electricité Médicale," 1897. Vessillo Israelitico, 1898, p. 398.